In this article, we’ll show you how to start a fashion blog, beauty blog or lifestyle blog using WordPress for 2018 and 2019. Regardless of whether you want to learn how to start a fashion blog, how to start a beauty blog, or how to start a lifestyle blog – in this step by step guide, we’ll walk you through the process of how to do it. The blog we’ll help you build is 100% mobile responsive, SEO friendly, and features intuitive and beginner friendly customization options that allow you to customize your blog to suit your style. Before getting started, it’s important to take a moment to define your target audience, identify your niche, and consider the things that will make your blog uniquely you, and entice users to engage. During this process, it would be wise to define the objectives and goals for your blog as this will have a significant impact on the strategy you implement. To assist with this, you may want to consider reading our beginner’s guide to starting a blog, as this post will focus more on the practical steps of how to start a fashion blog for 2018 and 2019, rather than the reasons for why you would want to start a blog. Is it unique, memorable, and You? Your blog name should be unique, memorable, and most importantly, it should be representative of you. It will be primarily your voice (at least initially) and as such should feel natural or organic. Choose something you can scale and grow with. Does the name of your blog have room to grow with you? Without a doubt there is value in tailoring your blog to a specific niche, in fact, if you try to speak with too broad an audience, you’ll connect with no one. That being said, try to avoid absolutes, for example, ‘the under 30s blog’, as you may exclude yourself from your own blog sooner than you’d like. Keep it as short as possible. A short name and domain is often easier to say, share, and will generally perform better in Google’s Search Engine Results Pages (SERPs), which will become more important as you build out your fashion, beauty or lifestyle blog. Make sure the domain name is available. Try to choose a name where the .com version of the domain is available as well as the social media handles. A .com domain is the most globally recognized and should be your number one option. Alternatively, try and secure either a niche specific top-level domain or one of the more commonly known domain extensions. * To check domain availability, follow the link below, hover over ‘Hosting’ in the main menu and select ‘Domain’. Enter the domain name and choose the free domain extension you want. If your domain name is available you will be taken to a page to review and purchase it. Alternatively, if it’s not available you’ll be shown other options or you will need to try something else. So whether it’s Independent Fashion Bloggers, The Sartorialist, or VOGUE, choose something that speaks to your niche and is something you can grow with. 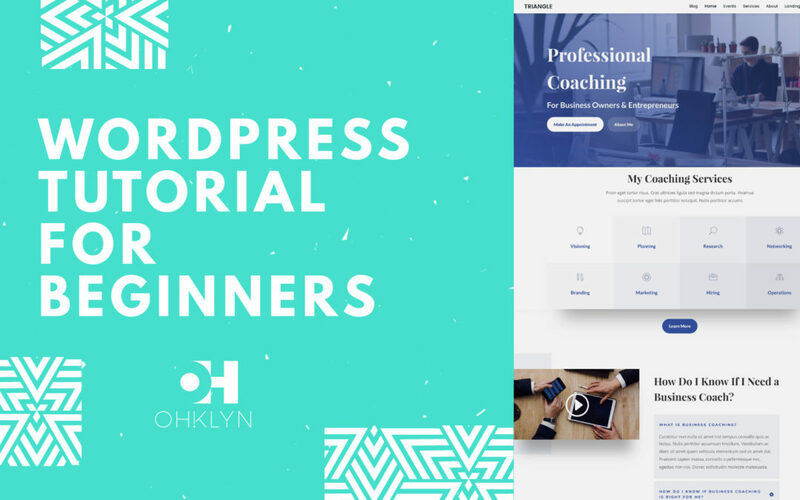 As a side note, what these three professional fashion, beauty, and lifestyle blogs have in common, is that they’re built with self-hosted versions of WordPress, which is exactly what you’ll learn how to do in this tutorial. Learning how to start a blog is a liberating and valuable skill. By the end of this article, you will be equipped with the tools to share your ideas, concepts or thoughts with the rest of the world. Pretty exciting right! This may seem obvious, but if you want to become a blogger, you need to start a blog. Blogging can be an amazing creative outlet, a tool for building credibility, and even a vehicle for creating a desirable lifestyle. Become a writer, marketer, or published author. Blogging will force you to become a better writer and content marketer. It is simply a byproduct of running a successful blog (not a prerequisite). For those aspiring to become a published author, blogging helps showcase your skills, all while building an audience and following. Want to become a subject matter expert? Blogging is a tool that enables you to take full control of this. Start a blog specific to your niche, and fill it with amazing content. This will help promote you as an authority on the subject and will most likely help yield greater exposure and opportunities for you. Make money or develop an additional income stream. Whether you want to make a few hundred dollars a month, or a few hundred thousand dollars a month, it is possible. In fact, there are a number of bloggers that make a full-time income from blogging. If that appeals to you, check out our post on how to make money blogging. Promote your business or personal brand. Do you have an existing business, starting a new one, or wanting to develop your personal brand? Blogging can be a great vehicle for connecting with potential clients and creating opportunities. A blog can also be used to provide additional value to existing clients or demonstrate your expertise and authority within an industry. Defining what success means to you and establishing clear metrics is the first part of the equation. For some, success may be measured in income generated from a blog, total or average monthly subscribers, monthly site visitors, community engagement, and more – What’s important however, is to articulate what you want to get out of blogging, and let this guide your journey. For the purpose of this article, we’ve defined a successful blog to be one that ticks all of the boxes above – This includes, high monthly traffic, strong engagement, profitability, and growing subscribers – think Neil Patel, Refinery 29, TechCrunch, etc. Consistent & quality content: Content marketing is a growing, multi-billion dollar industry. To stand out in your niche, you need to create quality and compelling content that adds real value to your users. In addition to this, we’ve found that most successful blogs use a consistent content schedule. This enables the consumption of your content to become a ritual for your users. Great design & user experience: With our dwindling attention spans, and constant overstimulation, we as bloggers need to leverage creativity, design, and media to create engaging customer experiences. Fortunately, there are a number of great tools to help with this. There’s the Hemingway App to hack writing, Headline Analyzer to help create better headlines, and image depositories like Pexels, Unsplash and Shutterstock for high quality stock images and videos. Insatiability: What does that even mean? Well, think about music, can you ever get to a point in your life where you’ve finally had enough music? Was the answer ‘no’? Great blogs have the same characteristic, you just can’t get enough. You love it, but will never be 100% satisfied or ‘full’, and therefore, keep coming back for more. An engaged community: Another noteworthy attribute of successful blogs is the sense of community. Mark Zuckerberg understands the value of community, and the power of our need to belong. Fostering a sense of community is achieved through having a higher purpose and a drive to have an impact on the lives of those in your industry or niche. Through creating engaging content that adds real value, and doing it with heart, you will develop a tribe of loyal enthusiast around your successful blog. For most people the biggest cost of starting a fashion, beauty or lifestyle blog is time or sweat-equity. Creating great content, learning how to optimize that content, and doing it on a consistent basis is by far the most challenging and costly aspect of getting started. In terms of the monetary costs, you’ll need a budget of about $100 – 250 to create a professional looking fashion, beauty or lifestyle blog. For this fashion blog tutorial, we’ll use the Cheerup WordPress theme and provide access to discount hosting through Bluehost. One of the biggest mistakes beginners make when starting a fashion, beauty or lifestyle blog is that they forget to begin with the end in mind. Thinking about what you want to ultimately achieve with your blog will make the process a whole lot smoother and produce a better result. Before we start installing WordPress and creating posts it’s important to take a moment to define your target audience, identify your niche, and consider the things that will make your blog uniquely you, and entice users to engage. What is the goal of your fashion blog? Once you’ve outlined the pages you want to include on your website and put together the rough layout for each page, you’ll then need to start writing the copy, sourcing or designing the images and graphics, and planning the navigational elements. Go through each page layout, write the content for each section and decide on the media elements you want to use. Sourcing great images for your website will an important aspect, to assist with this check out our Best royalty free stock photo sites article. Here you will find a list of free high-quality photo sites where you can download images that you can use on your website for free. And your brand color palette, including the hexadecimal color codes. We’ll show you how to customize your website with these colors later in this tutorial. There are a number of great tools like paletton.com, Adobe color, or color-hex.com that can be useful. User experience design is the process of optimizing the layout for your blog and ultimately how users engage with your blog to help achieve your objectives, be it newsletter signups, sales, etc. Posts – these will be the individual blog post that will make up the bulk of your blog’s content. Category or archive pages – which is how you organize your individual blog posts. Each post will be grouped or assigned to a category or multiple categories. The other components of your blog will include a sidebar (if you decide to include one), a global footer, and your menu or navigation. For this tutorial, we’ll use the Cheerup theme by ThemeSphere. This is a premium WordPress theme and features a number of layouts for you to choose from that have all been optimized from a UX perspective. You can view the various layouts below. Outline the pages, posts, and categories you want to include on your site. It’s often a good idea to draw this out, so you can visualize what you’re about to create. Before you start digging into writing blog posts, you may want to do some keyword research to understand the types of articles and information people are searching for. If you’ve got a huge social following and pushing content to an already engaged audience, this is less important, however, if you’re trying to build a following and gain traffic to your blog it will be smart to do some keyword research. There are a few ways of doing this, the most popular of is the Google Keyword Planner. You do need to set up a free AdWords account to use this tool. Alternatively, you can use the suggested search function built into Google by typing what you want to write about, or what you think potential site visitors would be interested in into the Google search box. Obviously, the queries that are more popular will be featured first. There are also professional tools that you can leverage. Our favorite is SEMRush. It’s not the cheapest, but in our opinion, it’s the best for keyword and competitor research. Ok, so there’s a lot to consider. Hopefully, you’re still with us and you can see the value in why it’s a good idea to think about all those things before jumping into starting your blog. If you haven’t already, the first step is to register your domain, set up your website hosting account, and install WordPress for your blog. So we’re all on the same page, let us quickly explain what they are. Your domain, or URL – is the web address for your website, and is what users will type into their browsers to access your site. For OHKLYN it’s OHKLYN.com. Pick something that works for you. Hosting, is what allows your website to be accessible to users 24/7. It’s the process of storing the content and data for your website on a web server and serving it to users. For this tutorial, we’ll walk you through getting started with Bluehost, as we believe it’s the best option for beginners. Ok, so let’s go through the steps for setting up hosting for your website and registering your free domain. Head to the bluehost website (massive hosting discount up to 54% + FREE domain). The free Bluehost domain extensions included are (.com, .online, .site, .website, .space, .tech, .store, .net, .org, .info, .co, .us, .biz, .club). Note: If you want a specific top level domain (TLD) or country specific domain not listed above, you will need to purchase it through a domain registrar like GoDaddy or CrazyDomains. You will also need to change the domain nameservers or (DNS) records to point at Bluehost’s servers. Here are the steps on how to change domain nameservers to point at bluehost. Select ‘get started now’ for the plan you want (shared hosting will be fine for most users & you can always upgrade later). Choose the hosting plan that’s right for you, hit ‘select’. Either use your existing domain, or type in the domain that you want (it’s free), then hit ‘next’. Choose your desired hosting term and domain add-on preferences. We recommend selecting ‘domain privacy protection’ so that the personal information associated with your domain, isn’t publicly available (optional). One of the reasons we love Bluehost is their easy to use One-click WordPress installation feature. In September 2017, Bluehost made the process of getting started with WordPress even easier. For new domains, WordPress is automatically installed for you so you can start building your site right away. When you see the ‘Congratulations’ message, click on login. You will be sent a verification email to the nominated email address for the account, which you will need to confirm. You can then set your password for your hosting account. Once you’ve done that, you will then be given the option to either ‘Start Building’, which will take you to the backend of your WordPress dashboard, or you can select to go to your Bluehost account. Congratulations! You’ve officially started your blog! It’s not much at the moment, but you’re a lot closer than you realize. As part of this process, we’ll provide a link to our article on how to set up your free SSL certificate which will encrypt the data on your blog. This is best practice as it improves the security on your blog, allows you to take payments on your site, and will improve your Google rankings. If you’re new to WordPress, we’d recommend reviewing our How to use WordPress article which is a free introduction to WordPress tutorial for beginners. Ok, we’ve covered preparation, as well as registering your domain, setting up hosting, and installing WordPress. We can now move on to the step number three. Whenever you want to log into the backend of your WordPress blog, enter your domain and add /wp-admin to the end (i.e example.com/wp-admin). Then enter your username and password that you set up in the prior step. You’ll then be taken to your WordPress dashboard. The WordPress dashboard or admin panel is broken down into 3 main sections: at the top, we have the WordPress toolbar, the menu or admin menu is located on the left-hand side, and the main admin area is in the middle, where we’ll do most of our work. We’ll give you a brief overview of each section now – however, for a more detailed overview, watch our free how to use WordPress tutorial, which is an introduction to WordPress for Beginners. This is intended to get you up to speed on the fundamentals of how WordPress works in about an hour. The WordPress toolbar at the top is dynamic and adjusts the available options depending on which page you’re on, and if you’re viewing the page from the front or backend. The Admin menu located to the left of your dashboard is separated into 3 main sections, these are: The Dashboard section, the Content Management section, and the Site Administration section. The Dashboard section provides easy access to the Dashboard, updates, and additional plugin features. The Content Management section is where you create and manage Posts, Pages, Media items, Comments and additional plugin features. The Site Administration section is where you configure the design and appearance settings for your website (including selecting the active theme for your website, creating and managing menus, widgets, and customizing your website’s theme). It’s also where we manage plugins, users, control global WordPress settings, and activated theme and plugin extensions like SEO, Social sharing, theme specific settings, and security. Lastly, the main Admin area serves as our primary workspace, and adjusts depending on what’s selected from the admin menu. We’ll go through some practical examples for each of these in the coming sections once we upload our theme and start working with content. One thing we recommend doing before we move on is updating the permalink structure for your website. This will impact how your URL strings will be created for pages, posts, etc. Hover over ‘settings’ in the admin menu, then select ‘permalinks’. The default option, leverages a more journal approach featuring the date in the permalink. However, the more common option and what we’d recommend from an SEO and UX perspective is post name. So we’ll select that option. If you want to update your user profile or add users to your blog, you can do this by hovering over ‘users’ in the admin menu on the left, and selecting from the options there. Once again, for a detailed walkthrough of WordPress, we recommend watching our how to use WordPress tutorial. A WordPress theme is a group of files that work with the underlying WordPress software to enhance the design and functionality of your WordPress website. For a more detailed overview, check out our What is a WordPress theme article. For this tutorial, we’ll use one of the top rated fashion blog themes – CheerUp by ThemeSphere. To access the theme (and any discounts when they’re available), follow the link below. If you want to use an alternate theme, that’s ok – you’ll still be able to follow along. We’ve created a list of the best WordPress themes for fashion blogs which you can access here. Follow the link above to the theme page, then click ‘Buy Theme’ to purchase a copy of the Cheerup WordPress theme for a once off fee. Go to checkout to finalize your purchase. If you haven’t got a ThemeForest account, you will need to create one. Then select your payment method. Once you’ve done that, you will then be able to download the theme files. From within your profile, head to ‘downloads’. Next to the Cheerup theme, click on ‘download’ and select ‘all files and documentation’. There’s also a folder called cheerup-child folder with the stylesheet which you can use if you want to use a child theme. To use a child theme, you will need to upload the cheerup.zip file first, and then follow the instructions in the Cheerup documentation. Check out our article on the OHKLYN blog explaining what a child theme is if you want more information on that. The last thing we’ll draw your attention to is the ‘documentation’ folder which includes a documentation.html file. If you open this file, it will take you through to the offline theme documentation and video tutorials for Cheerup. If you decide to go with a different premium theme, they will most likely have something similar. Click the link on the top of the page to go to the more up to date online documentation. From your WordPress dashboard, hover over appearance in the admin menu on the left, and select ‘themes’. From here, select ‘Add new’. Navigate to the .zip file you downloaded earlier, and select ‘Open’. In our case, it’s the cheerup.zip file. If you’re using a different theme, find the theme.zip file. Click ‘Install now’. This will start the process to upload and install. Once the theme is successfully installed, click ‘activate’, and your new theme will now be live on your website. If you want to install the child theme, follow the same process. Click on ‘begin installing plugin’. We’ll bulk select the required plugins and click ‘Install’. That will install and activate the required plugins, this may take a minute. We’ll check the status, then click on the option to ‘Return to Required Plugins Installer’. To activate any of the plugins we’ve just installed that aren’t activated yet, bulk select the plugins and select ‘Activate’. Once any required plugins are activated, we can return to the dashboard. You’ll notice that a few new tabs have been created in the admin menu on the left. If you’re using a different theme, be sure to follow the theme documentation to ensure you install the theme and plugins correctly. From your WordPress dashboard hover over ‘plugins’ and choose ‘Add new’. Then click ‘Choose file’, and navigate to the ‘plugin.zip’. file and select ‘Open’. Once it’s finished uploading, select ‘Activate plugin’. Like many premium WordPress themes, Cheerup is compatible with WPBakery which is a drag and drop page builder plugin. This isn’t a required plugin, however, it is recommended by this theme. Later on, we will provide you with a short introduction to the WPBakery page builder. In the documentation guide here, there’s a tutorial on how to use WPBakery. Ok – let’s move on to customizing your blog. By now your WordPress blog will be set up correctly with your WordPress theme installed along with any required plugins. We can now start customizing your blog to suit your style. How to import the demo content via the one-click demo content importer. How to upload your logo and branding elements. How to update the theme settings. How to create pages, posts, and categories. How to update the menu and navigation. How to update the sidebar. How to update the footer. How to delete the demo content you don’t want to use. The first thing we’ll do is bring in the demo content from the live preview that resonates most with you. As per the theme documentation, there are two options for importing the demo content. The first option is to import the full demo content, the second is to import the customization settings only. If it’s a new blog, then you can use either option. Because we want to bring in all the demo content, we’ll use option one. From your WordPress dashboard, hover over ‘appearance’ and select ‘Import demos’. If you don’t see this option, make sure you’ve installed the required plugins. From there, scroll through and select the demo example that you want to import. In our case, we’ll scroll down to the general option, then choose ‘Full Content’ from the dropdown to import the demo content, and then click ‘import’ to start the process. Once you see the ‘Import successful!’ message, run the ‘Re-generate thumbnails’ plugin from the prompt. Once it’s done, hover over your site name in the toolbar at the top left and select ‘visit site’. You’ll see that the demo content is all imported, and you’re now very close to having your very own blog. One of the things we like about this theme is that the customization options are built into the native WordPress theme customizer. While we’re not going to go through every theme setting, we’ll cover the ones that will be important to most people, and for everything else, there’s the theme documentation and videos. From your WordPress dashboard, hover over ‘appearance’ and select ‘customize’. To upload our logo, navigate to the ‘Header/Logo & Nav’ tab. You can either select an image to use as your logo or upload your logo via either dragging your logo in, or by selecting ‘upload files’, clicking on ‘select files’, and uploading your logo that way. To set your logo, select ‘choose image’. Repeat the process to update the various sizing options for your logo, or remove the other options. As you will see when you choose a header style for your site, not all logo sizes will work correctly. Unfortunately, their are no options in the customizer to adjust the size of your logo. So, you will need to make sure you have a number of logo sizes ready and play around untill you find combinations that work. Navigate to the ‘general settings’ tab. Then, to the ‘site identity’ tab. Where it says ‘site icon’, click ‘select image’. Once your favicon is there, give it an alt text, and then click ‘select’. Navigate to the ‘color & styles’ tab. Then, to the ‘general’ tab. Where it says ‘main theme color’, click ‘select color’ and enter in your brand color. This is where you’ll be able to make significant changes to the appearance of your blog. For example, if you want to set a background color, image or texture for your blog, you’ll be able to do that here. You can also amend the homepage layout with respect to the posts that are featured and the general layout style. In regards to the other homepage layout options, you’ll control the slider at the top in the ‘featured slider options’ tab, and the feature boxes via the ‘homepage options’ tab. Scroll down to the bottom of the theme customizer. You’ll notice that there is a tab called ‘Colors general’ and a number of other color related tabs below that. Here is where you’ll have full control over all the colors featured on your blog. Simply click into the various options and add the hexidecimal color code for your brand or choose a color from the color picker. So far we’ve looked at the General options, Homepage Options, and the Logo and Header options. We’re not going to go into all of the theme settings tabs, however, we’ll cover those that are the most important. These are located in the theme customizer which you can access from your WordPress dashboard by hovering over ‘appearances’ and selecting ‘customize’. Here, you can change the import a different demo site (settings only, not content). Doing this will change your site’s theme but will keep your customizer settings (where possible). This is where you can make major changes to the look and feel of your home page. You can make changes to how posts are displayed on your blog feed, the general layout of the page, change the featured slider, update the image carousel, and set up the MailChimp subscribe widget for your homepage. Use a ‘your latest posts’ homepage to get the most out of these settings. Here, you can upload a logo to your site. There will also be an option to upload separate logos to be used on Retina displays. You can also change the header area at the top of the page layout as well as the styling by changing colors, positions, and enabling/disabling features like ‘search’ and ‘cart’. Here, you can choose how posts will display on individual post pages as well as on the various pages they are listed, such as your home, category, archive, and search pages. You will be able to choose default post layouts, what metadata displays alongside posts, the default list styles, and what style of pagination you want to use (older posts, numbered pages or load more). This tab allows you to control which footer sections are visible on your pages; the upper footer, lower footer or both. You can also style them with colors, layouts, and choosing to enable/disable different features. Here you’ll be able to change the fonts and style most of the text throughout your site like body content, navigational titles, widget titles, and more. There are also options to style the size of each individual heading size. If you want to use Typekit, you would enable it here. This tab will provide you with most of the settings to change the colors throughout your site. These include your main theme, heading, text, links, hover colors, etc. This is also where you can upload a background image to your site and adjust certain spacing options. Import Demos where you could import another demo site and content. Performance where you can optimize how content loads for visisitors. Reset Settings where you can set all your customizer settings back to the default. Custom CSS where you can add your own custom styling. WooCommerce options are there if you want to include a store as part of your blog. For this, you’ll need to install the free WooCommerce plugin first. There are also a number of other customization options which may not be as relevant for this tutorial, but feel free to explore these as you go through. Anytime you make changes to your theme settings via the theme customizer, remember to click ‘publish’ to commit your changes. Next, we’ll move on to how to create pages and posts in WordPress. The first thing you’ll want to do is give your page a name. If you’ve selected ‘post name’ as your permalink structure, this will be used to create the URL for this page. On the right-hand side, you can select if you want to assign a parent page. This will impact the site hierarchy as well as permalink structure. For those wanting to create custom page layouts using WPBakery, here is a link to a full tutorial on how to use this page builder. Hover over ‘Settings’ in the admin menu and click on ‘reading’. Under the ‘Your homepage displays’ option, you can choose between ‘A static page’ and then selecting the page you want as your homepage from the dropdown, or ‘Your latest posts’. In our case, we’ll select the default ‘Your latest posts’ option. Remember to save your changes. You’ll create blog posts the same way you create pages in WordPress, the only difference is that you’ll need to set up categories first. For those new to creating blog posts in WordPress, follow one of the links below to a detailed tutorial on how to do it. The first option uses the classic editor and the other features the new Gutenberg editor. Using the classic WordPress post editor. Using the new Gutenberg post editor. By now, you should have roughly created the pages, posts, and categories for your blog. Don’t be concerned if you’re not 100% sure on the exact structure. What we’ll do now is create the menu structure for your blog so you can easily navigate around your blog while you continue to finalize your layouts and content. Menus in WordPress are created and managed in the dedicated menus section which you can access by hovering over ‘appearance’ in the admin menu, and selecting ‘menus’. If you imported the demo content, you’ll be able to select one of the pre-created menus from the dropdown lists, by choosing the menu you want, and hitting ‘select’. To add more options, click on the ‘screen options’ tab at the top and check the boxes next to the elements you want to add to your menu. Under screen options, you can also enable the ability to set the link target for a menu item, which means whether the link opens in a new tab or not, as well as assign CSS classes. At the bottom of the page, select where you want this specific menu to be displayed. For example, the ‘Primary Menu’. Select the elements from the left, then click ‘add to menu’. You can amend the order by clicking on the menu item and dragging it into position. To set these as mega menus and feature the posts and categories in the navigation, click on the dropdown arrow for the menu item. In the ‘mega menu’ dropdown where it says ‘disabled’, select ‘enabled’. If you don’t want to feature a mega menu, then leave this set to ‘disabled’. The sidebar in WordPress is referred to as a widget enabled area and allows you to set a global sidebar that appears on all pages, posts, or archive pages – where a sidebar is enabled. From your WordPress dashboard, hover over ‘appearance’ and select ‘widgets’. On the left, you have all the available widgets and on the right, are the widget enabled areas. With the Cheerup theme, there are a number of widget enabled areas. There’s the righthand sidebar visible on the right of most pages, the footer widget area located in the upper footer area, and the footer instragram widget area which is for an Instagram feed in the lower footer. If you imported the demo content, there will be a number of widgets added to the various sidebars and other widget areas. Click on the widget on the left. Select the widget enabled area you want to add the widget to and select ‘add widget’. Once the widget has been added, you can drag it into place. Click on the widget to amend its settings. Once you’ve updated the widget, hit ‘save’. To delete a widget, click on the widget. Ok, so that’s a crash course on widgets, there are theme specific widgets that reference ‘cheerup’ in the name as well as the standard WordPress widgets. Login to your MailChimp account. Create a new list that you want subscribers to be added to. Here is a tutorial on how to do it. Once you’ve got your list setup, navigate to ‘signup forms’ within the list and then to ’embedded forms’. Copy all the code in the ‘copy/paste onto your site box’. Go back to the widget panel within your WordPress site. Make sure the ‘Cheerup – Subscribe (MailChimp) widget is in a widget area. Then, expand the widget and paste the code you copied into the ‘MailChimp Form Submit URL’ field. Visitors should now be able to subscribe via the MailChimp widget in the sidebar. If you want to use something else like ConvertKit or Active Campaign, just add a HTML module to your sidebar, then add the embed code to a HTML widget. We recommend investing some time in going through all the widget options and settings available, removing widgets you don’t want and adding the elements you want. In the theme documentation, there’s a section on widgets, that explains the Cheerup specific widgets, and guides you through how to get the most from them. Ok, so your blog should be starting to take shape. There’s a bit of a learning curve, so try not to feel too overwhelmed. Stick with it for a few weeks and you’ll be through the steepest part of the learning curve. Remember to post any questions or comments via the comments section in YouTube, we’ll personally respond to every comment. There are three components to managing the appearance of your footer. These are the upper footer area, lower footer area, and the footer widget areas. Let’s explore all three. First is the upper footer menu. Like the primary navigation we created earlier, you are able to create a footer menu in the same way. As per our original blog site map, we want to include a footer menu with links to our contact, disclosure and privacy pages. Note: You will need to enable the footer menu via the ‘footer options’ tab in the theme customizer. Depending on the demo content you imported, the layout structure of your upper footer will be different. However, the fundamentals will be the same. Within the ‘general and upper footer’ tab you can change the layout of the footer. Different layouts will make different features available. Similarly to the sidebar, you’ll manage the content that’s in the footer columns via the footer widgets, which you can update by hovering over ‘appearances’ and selecting ‘widgets’. If you have a two column layout, only the first two footer widget areas will be displayed. If you have three columns, three will be displayed. If you don’t want the Instagram feed at the bottom, you can disable this via the widgets panel by opening the ‘Footer Instagram’ widget area and deleting the Instagram slider widget. If you want to have a menu in the lower footer, you will need to select a layout that allows it and then create a menu in the same way as we did before, but assign it to the footer area. Navigate back to the ‘footer settings’ tab within the customizer. Go into the ‘lower footer’ tab and you’re able to update or remove the copyright information via the ‘Copyright Message’ input box. Once you’re happy with how the footer of your blog is looking, remember to publish your changes. WPBakery, formerly Visual Composer, is one of the most widely used drag-and-drop page builders. It’s packaged with many of the biggest premium themes who don’t have their own built-in page builders or you can download and install the plugin separately. WPBakery features both a frontend and backend builder. From the WordPress dashboard, hover over Pages, and select ‘Add New’. To access the backend builder click the ‘backend editor’ button. To access the frontend builder click the ‘frontend editor’ button. In the accompanying video, we give a quick introduction into how to use the WPBakery page builder. In the documentation here, you will find a tutorial on recreating a magazine layout homepage. We suggest you run through it to get to grips with the WPBakery plugin and CheerUp. Here is a link to a video tutorial on using the WPBakery plugin. If you have followed along, you will have customized a significant portion of your content, including creating new pages, posts, categories, menus, updating the sidebar and footer, etc. If you’ve done that, or once you finish doing that, you’ll then need to go through and delete any of the demo content that’s still remaining. Go to either the all posts, or all pages tab. Hover over the page or post you want to delete. This will move the post or page to the trash tab, but not permanently delete it. To permanently delete content, navigate to the trash tab. Then, hover over the title and select ‘delete permanently’. Go through and delete any of the posts and pages that you don’t want to repurpose for your blog. Next is any categories or tags that have been created that you don’t want to use. We deleted our categories earlier, however, we will need to delete any tags we’re not using. Hover over posts in the admin menu and select categories or tags. You can either hover over the tag or category name and select ‘delete’. Or check the box to bulk select tags or categories. Then, under the ‘bulk actions’ dropdown, select ‘delete’ and click ‘apply’. Choose comments from the admin menu. Then, select the comments you want to remove. Once again, to permanently delete these, go to the trash folder and permanently delete them there. If you decide that you want to use a contact form on your blog for people to reach out, then you can either embed a form or leverage your favorite contact form plugin. Cheerup, supports Contact form 7 and is what they have included on their demo contact page. Contact Form 7 uses a shortcode to embed the contact form. For those unfamiliar with Contact form 7, here’s a link to a tutorial on how to use it. Once you’ve got your fashion blog looking the way you want, and you’re ready to launch your site there’s a few good practices that you should follow to ensure you get the best results. If you want your blog to be searchable via search engines like Google, then you will need to index your blog. To learn how to do this, watch our video on how to add your website to Google Search. In this video we’ll show you step by step how to add your blog to google search. Similarly, if you want to monitor traffic and user behavior on your blog, then you will want to install Google Analytics. Yes, we’ve created a video on how to add Google analytics to your blog as well. And, that wraps up our how to start a fashion, beauty or lifestyle blog tutorial using WordPress. We hope you got value from this tutorial and are on your way to launching your new blog.